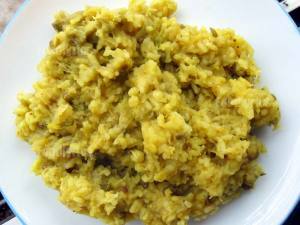 Khichadi is another recipe made from mung and rice. It is one of the most popular comfort foods among Indians. 1. Wash rice and mung Daal with water until water runs clear. 2. In a pressure cooker, add rice, mung daal, water, salt, turmeric and Hing – mix well. 3. Pressure cook for 10-15 mins/ 3 -4 whistles. Wait until pressure from cooker is gone before opening cooker lid. 4. Serve it warm and top it with some delicious ghee. You can also add veggies to it if you like.